This beautiful limited edition 2019 Neuhaus Egg Tin is filled with 18 Belgian chocolate eggs wrapped in an array of cheerful colors. These premium eggs come in delicious gourmet flavors, such as Milk Almond Praliné, Milk Salted Caramel l, and Dark Wild Strawberry. 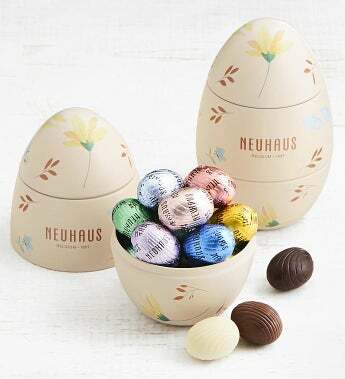 The Neuhaus Easter 2019 collection is inspired by the timeless beauty of decorative Easter eggs. Gift measures 3.5" x 3.5" x 5.25"
This beautiful limited edition 2019 Neuhaus Egg Tin is filled with 18 Belgian chocolate eggs wrapped in an array of cheerful colors. These premium eggs come in delicious gourmet flavors, such as Milk Almond Praliné, Milk Salted Caramel, and Dark Wild Strawberry.